When Congress insisted that NASA build the Space Launch System (SLS) some years back, the argument was simple: just adapt all this technology from the space shuttle program using the workers and infrastructure that already exist to develop a new heavy-lift booster. It all sounded deceptively simple — and deceptive it was. NASA and its contractors soon ran into a problem that affects many such projects: it’s often easier to build something from scratch than to modify systems that already exist. And there you have the problem with the SLS program in a nutshell. The core stage also contains four space shuttle engines, something the external tank never possessed. NASA plan to conduct a 500-second test firing with all four engines integrated into the stage has some unique challenges. “This test will stress the flight components as well as the ground equipment used for the test,” the GAO report stated. “For example, according to program officials, 7 of the 12 cryogenic fluid pumps at Stennis Space Center must work together in order to fuel the vehicle. “Should issues arise, the program will likely need additional time to assess and mitigate difficulties or glitches, which would likely affect delivery to Kennedy Space Center and could delay the enterprise integration and test schedule,” the report added. NASA is working toward a December 2019 launch date for Exploration Mission-1, which will launch SLS on its maiden flight an an automated Orion spacecraft into deep space. However, the flight is likely to slip to June 2020. The GAO’s assessment of the SLS program is below. 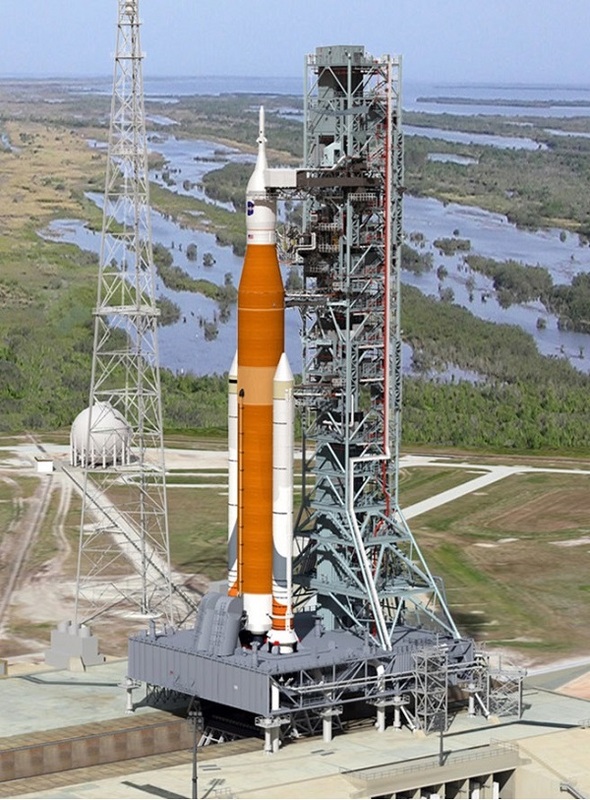 The Space Launch System (SLS) is intended to be NASA’s first human-rated heavy-lift launch vehicle since the Saturn V was developed for the Apollo program. SLS is planned to launch NASA’s Orion spacecraft and other systems on missions between the Earth and Moon and to enable deep space missions, including Mars. NASA is designing SLS to provide an initial lift capacity of 70 metric tons to low-Earth orbit, and be evolvable to 130 metric tons, enabling deep space missions. The 70-metric-ton capability will include a core stage, powered by four RS-25 engines, and two five-segment boosters. The 130-metric-ton capability will use a new upper stage and evolved boosters. In December 2017, NASA announced a new schedule and cost estimate for the SLS program, after determining that the November 2018 launch readiness date for Exploration Mission-1 (EM-1) was no longer feasible. NASA is now planning to an internal launch readiness date of December 2019, with 6 months of schedule reserve to a June 2020 date. The life-cycle cost estimate for SLS is approximately $9.7 billion to the December 2019 date and $9.8 billion to the June 2020 date. The delivery schedule for the program’s core stage — which functions as the SLS’s fuel tank and structural backbone—has continued to slip as the program addresses a series of technical challenges, including the completion of welding its large, first stage. The program currently has no schedule reserve to ship the core stage for testing, as well as from the test site to the launch site, in order to meet the December 2019 launch readiness date. Should problems or issues arise during testing, they will likely affect the enterprise integration and test schedule. In December 2017, NASA announced a new schedule and cost estimate for the SLS program, after determining that the November 2018 launch readiness date for Exploration Mission-1 (EM-1) was no longer feasible. In April 2017, we found that the date was likely unachievable for all three human spaceflight programs—Exploration Ground Systems, SLS, and Orion Multi-Purpose Crew Vehicle—due to technical challenges continuing to cause schedule delays and the programs having little to no schedule reserve to the EM-1 date, meaning they would have to complete all remaining work with little margin for error for unexpected challenges that could arise. The new internal launch readiness date for EM-1 is now December 2019, but NASA has also allocated 6 months of schedule reserve to June 2020 for possible manufacturing and production schedule risks. This represents a delay of 13-19 months for EM-1. The life-cycle cost estimate for SLS is about $9.7 billion to the December 2019 date and $9.8 billion to the June 2020 date, or 0.4 to 1.5 percent above the project’s committed baseline. The delivery schedule for the program’s core stage — which functions as the SLS’s fuel tank and structural backbone — has slipped 14 months in the last year to May 2019, due in large part to production issues that have delayed completion of the core stage element. According to program officials, the liquid hydrogen tank has proven difficult to weld to specifications because it is thicker than metals that have been used by industry in the past. Without a history of similar efforts to compare to, officials explained that they have to check and test every potential anomaly with increased scrutiny than if they were producing something already used throughout the aerospace industry. In addition, according to officials, because this is the first flight article, the contractors are performing extensive testing to ensure that their production processes and methods are resulting in end items that meet or exceed specifications so that the next unit can be produced more quickly. In addition to these issues, the program has faced work slowdowns and stoppages due to severe weather. In February 2017, a tornado hit parts of the Michoud Assembly Facility in Louisiana, where the core stage is being produced. While work resumed shortly after the storm, according to program officials, it did so at less than full capacity and delayed the program by a total of about 2 months. According to officials, repair work is complete in SLS manufacturing areas and should not further impact production work at the facility. The program has no schedule reserve through delivery of the core stage to Kennedy Space Center for the December 2019 launch date. In addition to completing production of flight and test articles, the program has to integrate the engines to the core stage and ship them to Stennis Space Center for a green run test. During this test, the core stage is fueled and the four main engines fired for about 500 seconds for the first time. This test will stress the flight components as well as the ground equipment used for the test. For example, according to program officials, 7 of the 12 cryogenic fluid pumps at Stennis Space Center must work together in order to fuel the vehicle. Should issues arise, the program will likely need additional time to assess and mitigate difficulties or glitches, which would likely affect delivery to Kennedy Space Center and could delay the enterprise integration and test schedule. In commenting on a draft of this assessment, SLS program officials stated that a vast majority of SLS development and production work is on track for EM-1 and that work is also proceeding for the first crewed flight—EM-2. In addition, officials state that the program is successfully working through first-time production issues that are not unprecedented for a program of this scope and ambition. Program officials also provided technical comments, which were incorporated as appropriate. SLS has taken so long that SpaceX has proven reusability of the 1st stage. Bolden said a Saturn-5 would cost as much as SLS, perhaps reusable.. Maybe the Senate would have asked for a reusable Ist stage if they could have predicted the future. Saturn-5 used skin-stringer-ring construction. SLS had to have a thick skin only to support 150tn. Harder to weld. Less workers needed though. If no solids were used I would not have to worry about a 4000 degree cloud of solid fuel to melt the parachutes in a destruct. No one else seems to be worried about that though. That is probably why Ares-5 was cargo only and Crew was on Ares-1. Good thing SLS will not have many missions. SLS: yeah yeah! welding it’ll get used by commercial companies and save loads of money. SLS: What are composites? Isn’t that what you use to recycle your farm waste? What does it have to do with rockets? Or at least anything that has main engines that lack the TWR because they are using the wrong fuel. Shuttle’s thrust on lift off was almost entirely SRB despite the RS-25s being the second most powerful LH2 engines ever built surpassed only by the derivative used by Delta IV. Sane people: yeah that was only useful for reusability in the 70s we are moving on to Methalox now. SLS’ huge schedule and financial costs are not so much about the technology, engineering, or team competence, and are more about the institutionalized political and financial incentives for government sponsored contract work. That incentive drives every project to take much longer and cost much more than initially planned. It is a natural result of politically-authorized government-led government-proprietary non-commercial work of any kind. It is not about the engineering. This is sane, from the political sponsors’ and marquee contractor business leaders’ perspectives. This is how it works for rockets, weapons systems, roads, utilities, the VA, and many others…. Engineers work within that paradigm to build cool stuff as best they can. SLS sits on the boundary between government-space and commercial-space. It was never going to be cheap. If commercial drivers for human expansion into space develop (e.g. : off-planet resource exploitation rather than flag waving political or scientific exploration), SLS will and should be totally eclipsed and the SLS labor force repurposed for off-planet commercial habitat and infrastructure development. Otherwise, it was always going to cost decades and many billions for dollars to ‘plant a flag and a few boots’ on Mars, Europa, or back on the Moon. My engineering soul is cheering for realization of the commercial angle. In that scenario, we get to build the most cool stuff. Yes, it’s called pork-barrel politics. Why did they say “Houston, we’ve got a problem…” instead of “Canaveral…” At-the-time Senator LBJ wanted the federal spigot moved over Texas’ way. Those were good, successful programs. That’s the way federal funding works and complaining about it is like spittin’ into the wind. Currently Senator Shelby has a tap into the process. What do the contractors that get to build the second SLS mobile launch tower have to say when he walks into the room? Three cheers for Senator Shelby! I don’t think you understand how government works. The rocket had to use SRBs. The whole point was to keep the various shuttle contractors employed. That was a feature not a bug of the design. Yep, and the first Block 5 flight was another Success! And yet, Not Shuttle-C would have been EVERYTHING promised about sls years ago. Same workers. Same infrastructure. Same srbs. Same ssmes. And same friggin tank. Just build a boat tail and fairing – maybe slap a Delta iv upper stage or J-2x stage or even ACES within the fairing and you’re done. How we got to this point is mind-blowing. I’m “making progress” on eating this large pizza by myself, but I’m not proud of it. “Making progress” in the wrong direction isn’t a compliment. Michael, why do you think Blue Origin chose LOX/LH2 as the propulsion architecture for New Shepard? There is no point in building a reusable SLS. The estimated flight cadence is predicted to be very low and it takes ~45% more capability to land a 1st stage back on the ground. If the capability is not needed to get a payload where it needs to go, why launch such a big rocket in the first place? SLS has been a pork project from day one that’s been used as a political bribe to get politicrats to vote for other bills in exchange. Lots of people at NASA don’t want it and have had to dump projects they did want to do to keep within their paltry budget. If SLS was being built with a specific and reasonable goal in mind, maybe it would be worth the cost and effort. Just to build it as a generic “heavy lift” vehicle is stupid. It’s unlikely to be particularly suitable for any mission just like the Shuttle. I’d much rather see work being done on a vehicle to take astronauts back to the moon and this time to stay for a while. I wouldn’t go as far as saying SpaceX has “proven” reusability. It’s never been an impossible thing to do, it wasn’t financially viable. Since SpaceX isn’t public, there is no way to evaluate whether they are saving any money by landing and reusing the rockets. If anybody has managed to steal a copy of the company financial statements to prove otherwise, please put them online and provide a link. It would also be interesting to see a work up on how a F5 would compare in cost if it were thrown away over reusing a F9. Not really. The first part of flight is generally full throttle so solids are a simple way to increase power without adding too much complexity. After a vehicle is on its way and more control over thrust is required, liquid fueled is the better choice. It’s also easy to jettison the solids after they are used up. Partly due to the number of engineers that have experience working with HydroLox at the time that New Sheppard was started. Especially since there was no Methane engine in production and the only Hydro-Carbon engine in used was the venerable RS-27. Partly to developed a upper stage engine on the cheap. If you have a development version being tested on a recoverable sub-orbital vehicle. Since the BE-3 is capable of being deep-throttle down to about a sixth of the maximum rated thrust. It have application as engine on various landers for the Moon, Mars and other places. It wouldn’t surprised me if the Blue Moon lander is a re-hashed New Sheppard booster. So no launch until Jan 2020 at the earliest. Funny how it only gets 2 pages of coverage in this report given its % of the NASA budget. Composites aren’t a panacea when it comes to cryogenic propellant tanks for a variety of reasons. That isn’t the problem here. Yes, if I recall the original core was made up of engineers from the DC-X program. If they had gone with the Shuttle-C solution it would been too easy to keep the Shuttle operational. They wanted to make sure it couldn’t be brought back. Plus Dr. Griffin bought into Dr. Zubrin’s Ares idea as being quick and simple to do. I do understand. The Challenger astronauts died because NASA decided to build the SRB’s in Utah and not in Louisiana. The reason is that Louisiana already had the ET to build. The financial viability is a simple function of the cost of turning it around. The fuel and go ability should make it very viable. The Shuttle abandoned all hopes of being financial viable when they decided to use SRB’s, an ET and tiles for the heat shielding. As for “providing” reusable rockets, that would have been the Germans with the A5 rocket and the ME-163. Some of the latter airframes would be flown multiple times per day. SpaceX already offers customers a price discount for using reflown cores. Unless you’re one of those who think the company is selling launches below cost, then it shows that they save money by reusing cores. We’ll see how well the composites hold for BFR. I worry that is X-33 all over again. I’ll support SLS–but all the best to Elon. It’s that darn car company that is going to be the death of him. Want composites for the future?–that will come as the automobile industry dies in about 25-30 years. No more spy reports, no more auto shows. We’ll all be in pods. To use the SLS -bashers mantra,, Tesla is Musk’s MAF. Sell that car company to a real dinosaur, GM.Let them die together. Use the funds for BFR–out of metal.